Copy the code below and save it as an XML file. In Notepad++, go to Language -> Define Your Language... -> Import. Import the XML file and it will appear in the Language menu. The UDL system of Notepad++ is not perfect so I had to do some hacks to get this to work. If you type an array of values, the commas are highlighted along with the numbers. There's nothing I can do to fix this. And if a number is touching the EOF, it will not highlight correctly. Lastly, you need to use the ASM6 file extension so that you don't get any conflicts with the default Assembly highlighting. Other than that, this should work well and be easily adapted for other assemblers by changing the directives in the 3rd keyword list. If you do this, feel free to share below! Nice job! It seems it requires a dark background theme though. Mine requires a white background, I wish I knew how to make it universal. I also have problem getting numbers to highlight correctly in certain situations. Mine is more general than just ASM6 or 6502, it has mnemonics for 6502/8500/8502, 65C02, HuC6280 and 65816/65802. It's also not based on the default x86 highlighting and uses much more colours. 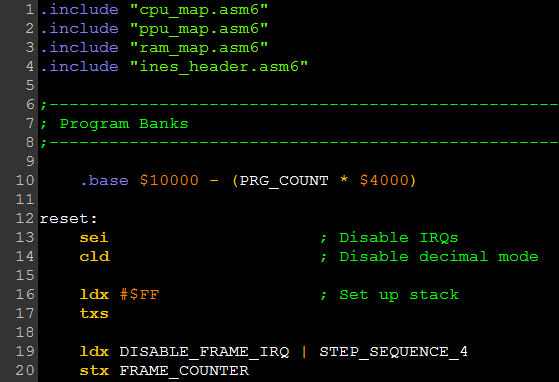 Instead of supporting every directive of every assembler it simply uses "." and "@", used as many assemblers for directives or local labels, as prefixes. Mnemonics for common aliases and illegal opcodes are also included but in their own colours. SAX is an exception because it's a valid opcode on HuC6280 and is therefore also highlighted as such. Wow, thanks for sharing! And for giving it in [code] instead of a link. I knew people would have better UDLs than me, but I put up the thread anyways because I was tired of finding dead links left and right. This will go a long way towards preventing future frustration for people using search engines. I'll have to give this x65 highlighting a shot. Using the prefix mode to get the . and @ sounds clever. And at a glance you seemed to do a more elegant job at handling number prefixes.